This article examines the procedural fairness rules relevant to the disclosure of documents in the jurisdictional context of guardianship tribunal hearings. 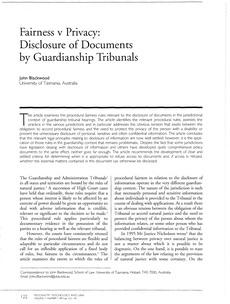 The article identifies the relevant procedural rules, assesses the practice in the various jurisdictions and in particular addresses the obvious tension that exists between the obligation to accord procedural fairness and the need to protect the privacy of the person with a disability or prevent the unnecessary disclosure of personal, sensitive and often confidential information. The article concludes that the relevant legal principles relating to disclosure of information are now well settled; however, it is the application of those rules in the guardianship context that remains problematic. Despite the fact that some jurisdictions have legislation dealing with disclosure of information and others have developed quite comprehensive policy documents to the same effect, neither goes far enough. The article recommends the development of clear and settled criteria for determining when it is appropriate to refuse access to documents and, if access is refused, whether the essential matters contained in the document can otherwise be disclosed.